Japan's sixth largest city Fukuoka is situated on the north shore island of Kyushu, and boasts a rich mix of historic sites, heritage architecture and long sandy beaches. It is here that we are travelling today to explore an intriguing modern dwelling with a bold and dramatic facade. 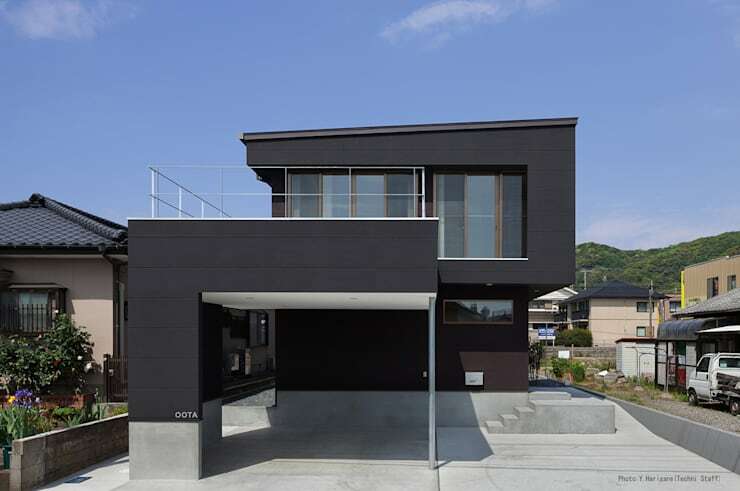 Designed by Matsuoka Architects, this contemporary abode is a family-friendly residence which makes a striking statement within the neighbourhood. 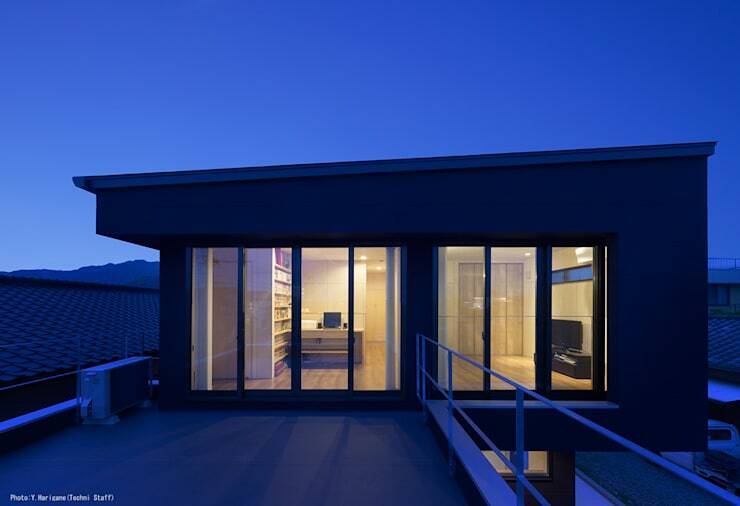 Constructed using integrated living spaces, the home goes by its nickname The Link House. These different sections within the property help the interior feel warm, welcoming yet open plan and spacious. Clever use of space invites the occupant into the different rooms of the home, imparting hospitality, with ample eye-catching elements and features. If you would like to take a peek inside this unique abode with a surprising interior, check out the images below and perhaps gain a little inspiration for your own home renovation or makeover. Our first impressions of this dwelling are directly related to the eye-catching and bold timber facade. Clad in a dark, almost black, timber, the entrance is dramatic and attention grabbing. The structure is put together using three simple cube-like pieces, giving the contemporary home a true 21st century aesthetic. A strong concrete base provides the home with a basic carport base, as well as a set of stairs that appear to rise from the foundation, creating an interesting and characterful addition to the property. The terrace rises outward towards the street, offering the occupants of this home an interesting and unique place to entertain guests, friends and family. Moreover, the slightly sloping roof helps to give the dwelling an interesting perspective from street level, adding to the strong architectural lines seen throughout. Moving inside the dwelling we check out the entrance hall. A rich tapestry of different pale timber tones, this room is reminiscent of a traditional Japanese abode, with a combination of heritage class and contemporary style. The concrete is continued through from the exterior of the house, and forms the flooring for the interior. This is paired with medium polished timber floorboards, which juxtapose the cool hardness of the concrete, with the warmth of the wood. Within the living area we see the continuation of the timber panelling and concrete floor. 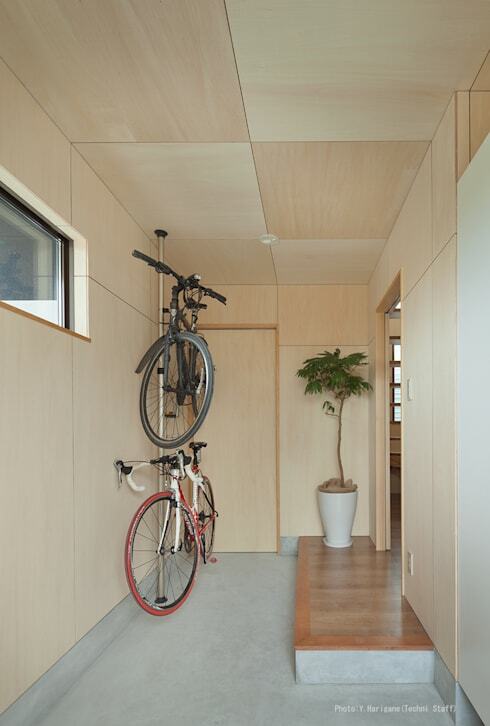 Dominating the interior is the light wood cladding that covers the walls and ceiling. This provides a simplistic modernity, but with a sense of warmth and a cosy ambience. Baulking the commonplace use of sofas, the designers have instead opted for a raised timber sideboard, which snakes around the entire living room. This works in a multipurpose fashion, as both stairs and a seating. To the right we are also able to see the cooking space, which subtly hides behind more timber cladding. Turning around and changing our perspective, we are able to see the staircase and entrance. 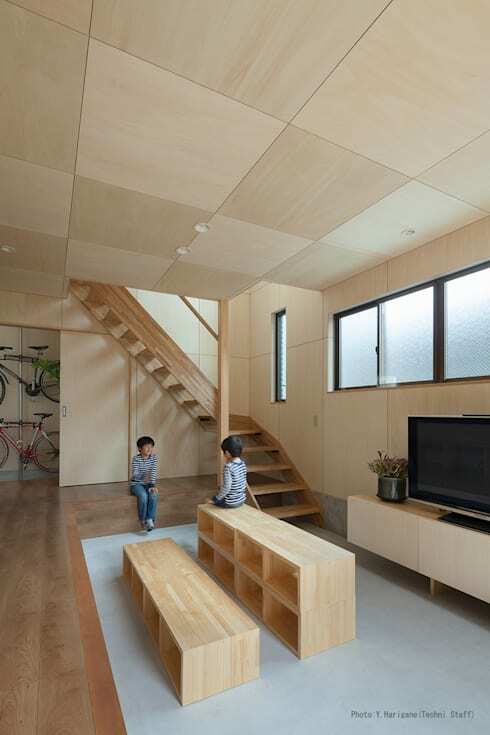 The stairs are minimal and work in a way that prevents them feeling disproportionate within the room. 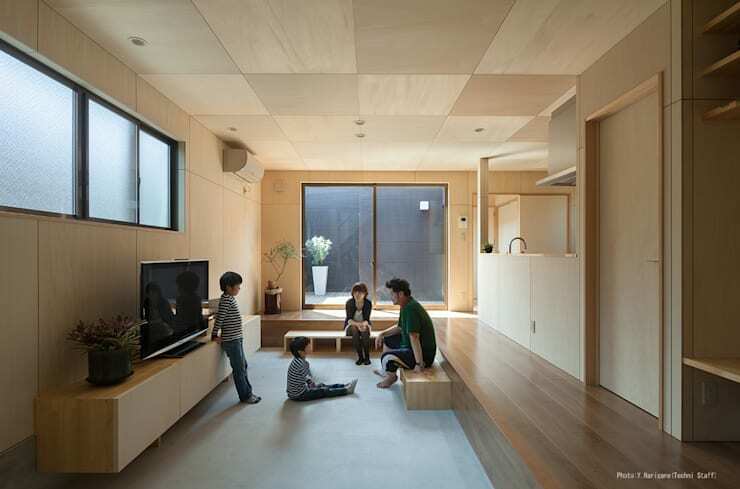 The sense is that this space is clean and crisp, with each section of the house offering cohesive movement and energy. If you need assistance designing your own abode, find yourself an architect via the homify website. Throughout the dwelling we see how well the architects have incorporated interesting pieces of built-in furniture to maximise space. Every centimetre of the floor plan has a purpose, even if it is to inject negative space in order for the room to feel minimal and uncluttered. In this image we are given a glimpse of the upstairs study area. Ideal for those in the family who need a place to get homework completed, use the computer, or get a little work complete before the next day's workday. 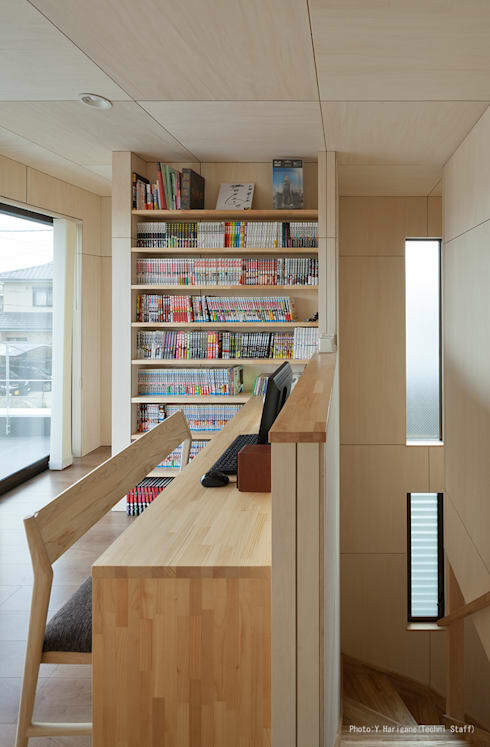 Additionally, in the distance we see the neat built-in bookshelf that provides ample space for the household's books, DVDs and other accoutrements. Furthermore, we are able to see how light is brought into the stairwell and corridor. Thin frosted panels of glass have been installed, ensuring the area remains light, bright and airy. Before we end our tour we take one last look outside at the facade of the home. In this image however, we see the extensive outdoor terrace that provides ample space for entertaining and hosting events and parties. From this vantage, and at dusk, the home appears extremely welcoming with its warm inner glow, and comfortable minimalist interior. Large glazed sliding doors ensure the home is filled with natural light during the day, while the dark facade helps the house blend into the night seamlessly and subtly.